Tuesday • June 21 • 2016 Volume 84• Number 25 bp Broadcaster Press INSIDE: ? Menards ? Bomgaars ? Employment Presorted Standard US Postage Paid Permit #8 ECRWSS Vermillion, SD ? Sears Postal Patron Local Since 1934 201 W. Cherry ? Vermillion, SD 57069 ? Phone: 605-624-4429 ? Fax: 605-624-2696 ? www.broadcasteronline.com HUGE 35TH ANNIVERSARY SALE! 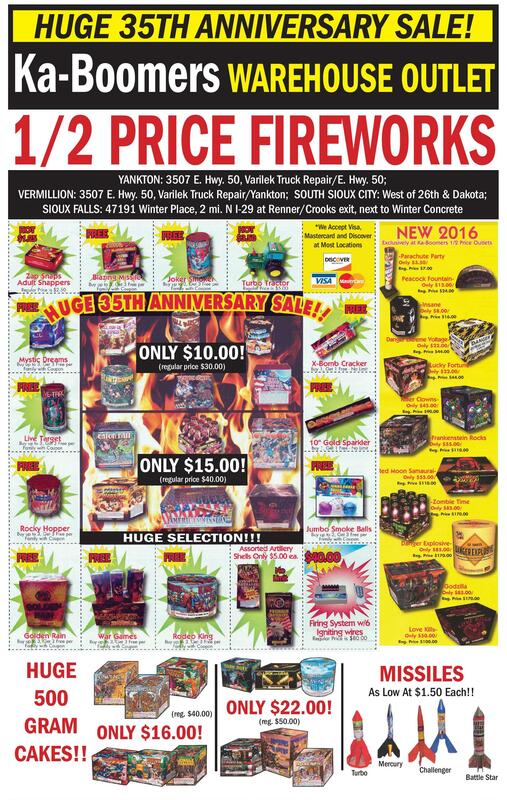 Ka-Boomers WAREHOUSE OUTLET 1/2 PRICE FIREWORKS YANKTON: 3507 E. Hwy. 50, Varilek Truck Repair/E. Hwy. 50; VERMILLION: 3507 E. Hwy. 50, Varilek Truck Repair/Yankton; SOUTH SIOUX CITY: West of 26th & Dakota; SIOUX FALLS: 47191 Winter Place, 2 mi. N I-29 at Renner/Crooks exit, next to Winter Concrete *We Accept Visa, Mastercard and Discover at Most Locations ONLY $10.00! (regular price $30.00) ONLY $15.00! (regular price $40.00) HUGE SELECTION!!! HUGE 500 ONLY $22.00! GRAM ONLY $16.00! CAKES!! (reg. $40.00) MISSILES As Low At $1.50 Each!! (reg. $50.00) Turbo Mercury Challenger Battle Star Home of Great Ideas since 1934 201 W Cherry St. • Vermillion, SD Phone: 624-4429 • Fax: 624-2696 BroadcasterOnline.com 109 East Third, Yankton www.hatchfurniture.com 605.665.4416 • 800.798.4663 Monday-Friday 10-6, Saturday 10-5 Evenings by Appointment 50% Off ALL Furniture* Plus Up To 48 Months Special Financing! ** Some restrictions apply. See store associate for details.